Beautiful photos. They certainly brighten up a dreary day in the UK. What type of bird is it? Thank you – I’m pretty sure that bird is a “Flicker” and part of the woodpecker family. I love their coloring. Wonderful shots and great post, Ingrid. The saguaros are fascinating! The photo showing all its lines and the one with the Flicker (I think) feeding on the flower are gorgeous. Happy New Year! Thank you. I appreciate the comment. Here’s to lots of great pics in 2018. 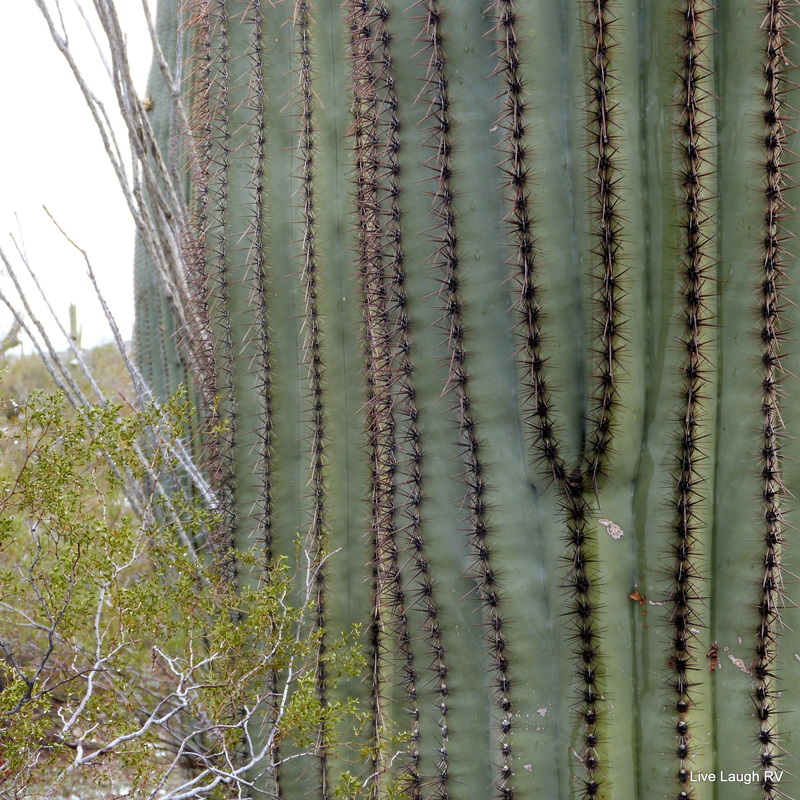 Wonderful article, and magnificent photos of the Saguaro. Thank you. I am enamored with those saguaros. Just wanted to stop back by…hope you had a wonderful Christmas and to wish you a happy New Year. Yumm! Going to have to make some soup now! Looking forward to trying your recipe. Love those cacti too! It’s my go to soup especially if it’s cold out. Due to lack of precipitation this year in the desert, the cacti are looking a little sad. I’m not expecting a very good showing of blooms this spring. Thank you so much for not only your amazing information on the Siguara cactus, but also the correct pronunciation. I too thought they were a fictional addition to cartoons and old time westerns. Your soup didn’t look half bad either, but perhaps not for us in the Southern Hemisphere just at the moment. Have a happy and safe silly season Ingrid, and I hope 2018 is kind to you. Thanks Chris. The soup is perfect these days as the desert does get quite chilly once the sun goes down (30-40 degrees Fahrenheit overnight). Unfortunately, the desert hasn’t had much rain in the past several months and the cacti aren’t looking as robust as I’ve seen them in the past. I also don’t expect much in the way of wildflowers this spring. Oh well, things cycle and last spring was stunning. Hope you’re enjoying the warm weather and your garden is growing. That crest is amazing. The soup sounds tasty too. So fascinating the way the crested saguaro grows and the pattern created. Nature is amazing! Yes! Mother is amazing. I am constantly surprised. Here are some great photos of saguaros – plus a recipe! Thanks for the reblog. Seems like you are enamored with the saguaros as much as I am. Love these shots. I recognize the mountains but where is that coyote sculpture? The coyote sundial is on the Interpretive Trail within Lost Dutchman State Park. Super easy informative trail that goes between the picnic area and the campground. Love those Superstitions Mountains! My guide services are at your disposal 😉 and I know you’ve been on the west side of the Superstitions near AJ. Thanks and yeah, I hear ya on needing a change. 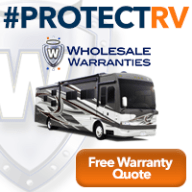 That’s the beauty of a home on wheels. 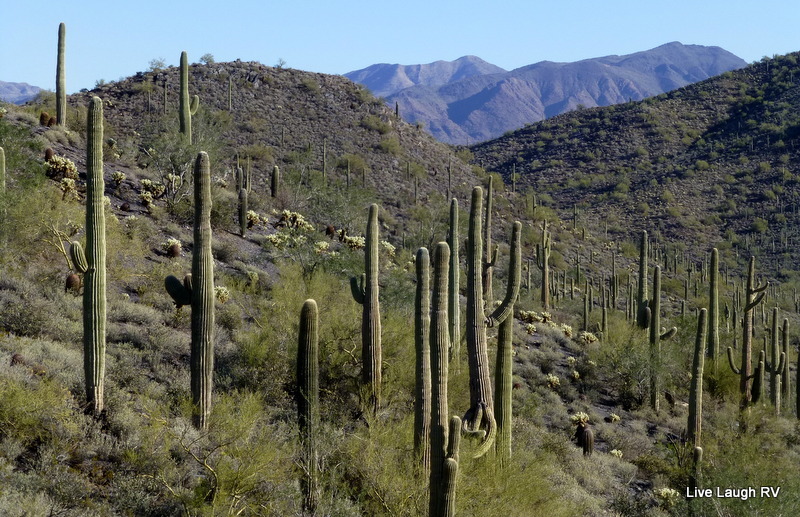 After living among these majestic saguaros, we always look forward to moving on in search of pine trees and mountains. It’s amazing what our bodies get used to. In the dry desert heat, I’m not bothered until the temps soar over 90. Then I’m ready for A/C. Thanks for the info on the book. I will definitely search it out. They certainly are fascinating! We cannot wait to get back into an area where we can see saguaros again. Love the one picture with the Flicker! We do enjoy our time in the desert, but am definitely missing our sojourn to the coast this winter. I’m relying on you for my fix – share lots of photos. Hope you enjoy the TX Gulf Coast as much as we do. I love San Diego even though it’s a tad on the expensive side. So, not a bad place to spend a few months. However, I do enjoy Arizona and its diversity and obviously less expensive than CA. The saguaro cactus is definitely the star around here. Nothing smells as good in the RV as home made soup in the crockpot. I will definitely be giving your recipe a try…soon! Our weather is perfect here for a warm bowl of yummy goodness. What a great post! Loved learning about the saguaro cactus! And the soup sounds divine – for our freezing cold we’re experiencing. We’ll have to try it! Thank you Debbie. Hope it warms up for you guys real soon. Crazy weather! My daughter and husband are in for a try with your soup. But my son in law said he’s “chickened” to death and wonders how it would be with beef broth and shredded beef. Hummm, just doesn’t sound too good to me but maybe??? Great post! We do love our Saguaros! And I agree with you… the 70’s here was quite chilly! And when it got down to the 40’s we had our fireplace on! It was almost too cold to sit outside to watch the sunset … almost. Does require a little bundling up though and a bowl of hot soup always helps! Very informative post Ingrid. I do like learning about flora & fauna. It was partly the reason for starting out in this RVing lifestyle. As for the soup, I definitely intend to make a pot after my next shopping trip. Thank you. I know FL is lush with beautiful flora & fauna. Very different than AZ. I love traveling between diverse landscapes … beauty of a home on wheels. Enjoy the soup! I made your soup recipe for dinner tonight. It was a hit! Great flavor. Thanks again. What an educational blog post!! I leaned a lot about saguaros and also how to pronounce correctly!! I was a wee bit off!! I really love the crested saguaro!! Your recipe sounds delicious!! I am going to give it a try this week!! Thanks!! Love your photos. Just got back from visiting my aunt in Mesa and the Superstition mountains are always such a beautiful site to see. I lived out in Apache Junction when I was a kid so it was right in our backyard, we practically lived at Canyon lake every weekend. I will always love the desert. Thanks for sharing these beautiful pictures. Ah, Canyon Lake and the Superstitions are a couple of my favorite spots here in the valley. Thanks for stopping by and commenting. Great pictures!! So interesting. your title threw me off, i thought you were putting cactus in your soup. Haha … I was aiming for that. Obviously, it made you look. The prickly pear cactus is the one used for cooking. Some places around here actually serve ‘prickly pear ice cream’ 😲 I’ll stick to photographing the cacti and leave the eating to the javelinas! I love all cacti, especially the saguaro. I loved heading out to the desert on those rare occasions when we got a dusting of snow while I lived in the Phoenix area. Your soup recipe sounds yummy Ingrid. And your photos are always wonderful. Thanks Lu and yes the desert is amazing after a heavy rainstorm or that rare dusting of snow. We were staying at Gilbert Ray CG in Tucson a few years ago when it snowed. What an amazing sight and I felt all the cacti were doing a happy dance as they swelled with moisture. Good for you. I have never been good with New Year’s resolutions. 😦 I try to focus on fitness especially while we are here since we have a gym available to us. I find that being on the road is not good for upper body strength. I always feel like I’m starting over again each time we arrive back at Jojoba. I will give that some thought. I am trying to put a program together for myself when we hit the road again. I love your photos. Thanks for the soup recipe. I can’t wait to try it! Thanks … that soup is perfect for winter weather. Great photos. 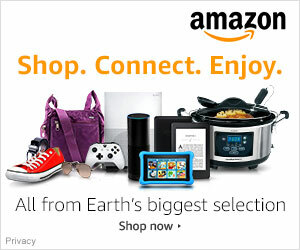 Are these with your new ZS70? Thank you John. The photos in this post were taken with the FZ200, but in the previous post almost all the photos were taken with the new ZS70. I’m trying to shoot with it exclusively lately so I can learn its strengths and weaknesses. At the farmers market, I silenced the shutter and had fun snapping away. I love any army of cacti! We took a guided hike of the saguaro many years ago. They are so fascinating. You did a great job of hitting the nightlights. Thank you. This is one of my favorite soups, but then again, I’m not an accomplished chef like yourself. I would have to take off my Jacket or coat if it was that warm here in Ogden Utah. it was 21 deg F this morning when I got up. It is now 36 deg F Must be a heat wave. LoL! Have a great day and enjoy. I know … I used to be quite comfortable with temps in the 60’s, but my blood has definitely thinned. I don’t even pop on our A/C until the thermometer exceeds 85-90. It’s amazing what we get used to. I don’t know what I like more…the story about the saguaro or the recipe. Great post. Thank you Karen. Hope you enjoy your holidays and can’t wait to hear what you cook up. Such fascinating cacti and I love the odd shapes. I didn’t know about them plumping up like that! The soup looks delicious. I’ll be over shortly for a bowl. Well at least in my dreams. I really enjoyed this post, Ingrid, thanks so much. I liked hearing about the chill of the desert right now and the smell of the soup cooking, it looks and sounds delicious. The saguaro cactus overview was fascinating. I love saguaros, such curious and remarkable plants, but I have only visited them, not lived around them. That they plump up with the rain, have a ribbed skeleton, and take half a century to develop an arm is very interesting. The crested saguaro blew me away! How gorgeous it is. Your photos here are truly wonderful. 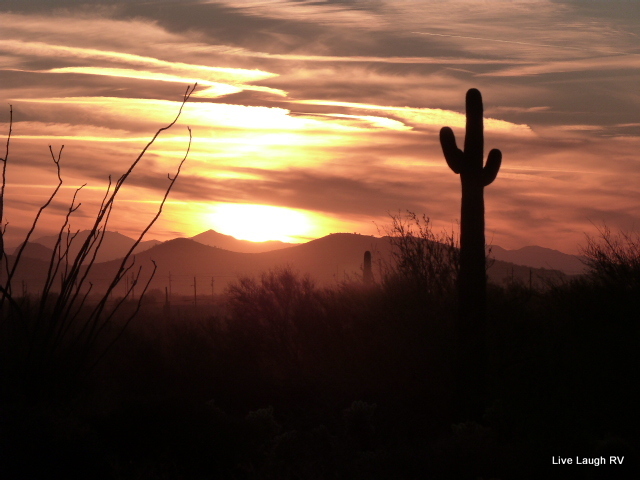 The silhouette of the saguaro in the sunset, and the gilded flicker on the cactus flower are stunning photos. Thank you Jet. I’m so glad you enjoyed the post. I love immersing myself in an area for a lengthy stay. It allows me to observe the landscape and how it changes. 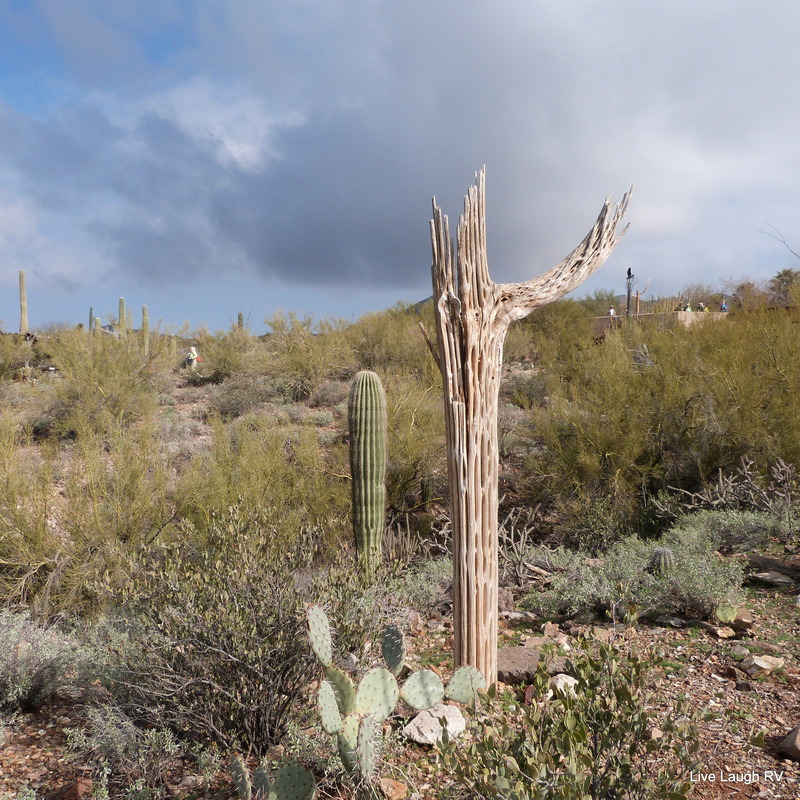 The majority of these photos were taken last season when the saguaros were plump with moisture. For the past several months, this part of AZ has received very little if any precipitation and the saguaros look like they’ve been on a diet. It’s fascinating to see the change. Yum! I make Southwest chicken soup with rotisserie chicken, too. It makes it so much more delicious! Sounds like the perfect thing to serve with your beautiful desert landscape and majestic saguaro as a backdrop. We’ve seen Gilded Flickers and Gila Woodpeckers in saguaro nest cavities, but I’m always hoping to see an Elf Owl! Your saguaro photos are beautiful. Ooh, an Elf Owl 🦉 I’ll have to keep my eyes out for one … after I check Google 😄 It’s been so extremely dry around here this year, that I’m not seeing as many birds and the saguaros look like they’ve been dieting. Love the desert after a serious rain. Thanks, Ingrid, for this interesting article. I’ve learned a lot aout those intriguing plants. And thanks for the great pictures. Thanks Pit. It’s always fun and enlightening learning about different regions of the country. Glad you enjoyed the info. The saguaro cactus has always fascinated me, too. Thanks to you I now know more about them. Your chicken soup sounds delicious! Although we live in the southeast we eat a lot of southwestern meals and I will add this recipe to my other crockpot recipes. It’s interesting how those of us who have grown up far away from these cacti, find them so extremely fascinating. My son’s Phoenix native fiance doesn’t get my intrigue with them. And who doesn’t love the flavors of the southwest? Hope you enjoy the soup recipe. Let me know if you make it and your thoughts. You welcome. Glad you enjoyed the post. The Eco system around here is intriguing and I learn something new about it regularly.